I have flown this aircraft three times, once in Business, SYD-LON and then economy SYD-DOHA. The aircraft itself and Qatar service always immaculate and the cabin crew maintain attention to detail throughout flight. Ok so...business seat first 22A. This seat is left hand side, last row of business before the sky lounge area. Some people complain too close to the curtain separating the lounge and next to the toilets. For me was perfect, next to the lounge lol and next to a toilet ! !..noise etc not an issue. 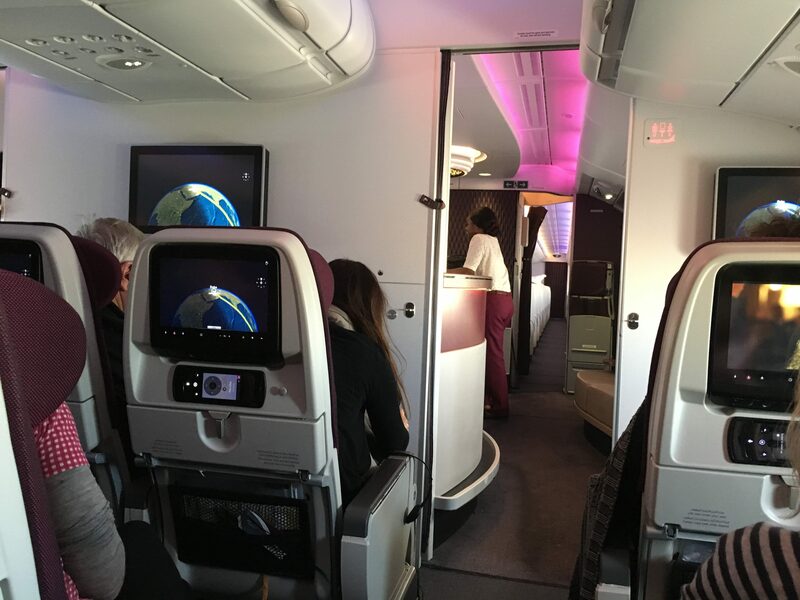 The business pods are the best..full lie flat, range of controls and Qatar business service is 5 Star...so for me actually a good seat, well placed as I could get out of seat and wander directly into the lounge for a beer....ok economy I have been in 80D and 73A. Start with 73A...left hand side window with galley wall behind seat...means u lose a little in recline but not much, still goes back a fair way. Proximity to galley means you get cabin staff serving you first ahead of the service trolleys...bonus! Also I like long flights with nobody behind me, especially those who feel the need to continually thump on the touch screen behind your head while playing a game!..so for me I had no disturbance...galley noise not an issue as hardly any and leg room was fine...onto 80D...aisle seat on left hand side of the four seats in the middle...toward the back of plane...leg room unobstructed and ample...bonus is that simply hop out and close to the toilet and the rear door area where you can stretch legs on a long flight...downside...last to get served food and as I found, you will probably miss your choice of what you want to eat...little tip ..the outer armrests can be swivelled up by pushing in a tricky little lever where armrest joins seat, makes getting in and out so much easier...overall no complaints though for A380 or Qatar, they are my airline of choice...also flew the Qatar A350 business...amazing plane and service again hard to beat. 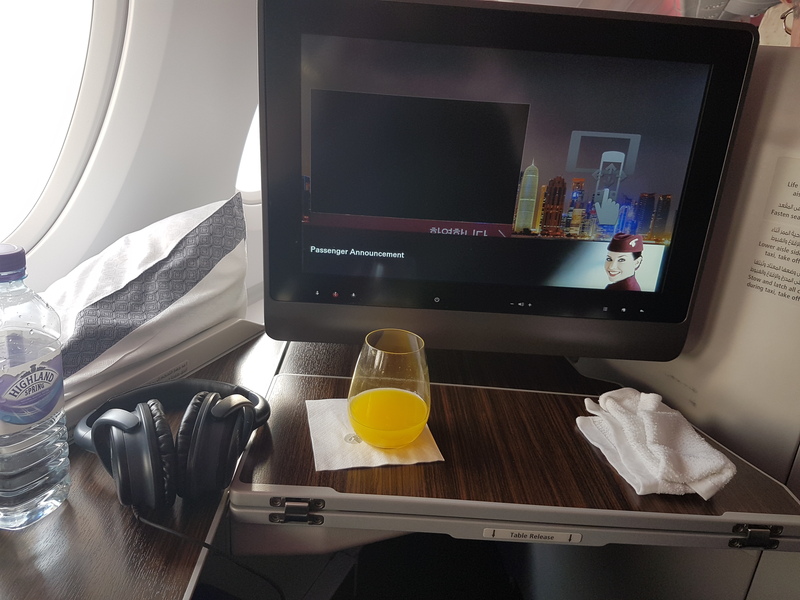 Hi..back again for maybe my last review of this plane with Qatar given the frequency I travel on it. I had to do this one though for anybody thinking of doing Business Class and to say avoid 10K. I am not fussy..never have been being ex military and flying in all manner of things and takes a lot for me to say something, but avoid 10K! The one plus is probably getting off first thats it, the rest is downhill. 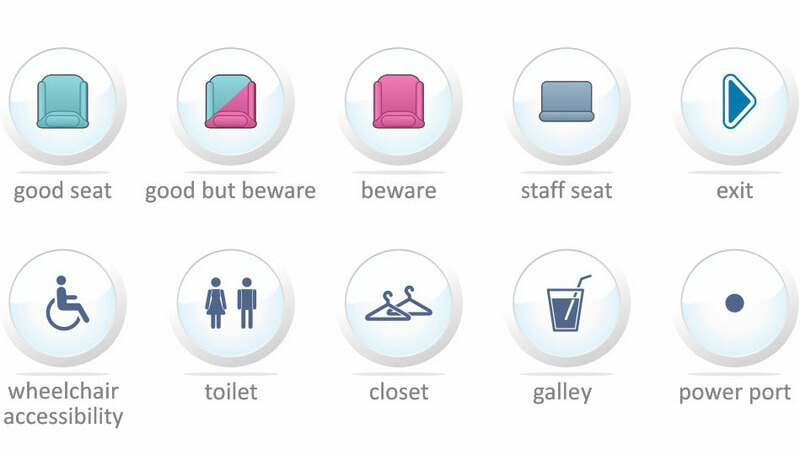 It is in very close proximity to the toilets and galley and the frenetic pace of service and continual in and out and drawing of galley curtains is very noticeable then add the people in and out of toilet; was just non stop. 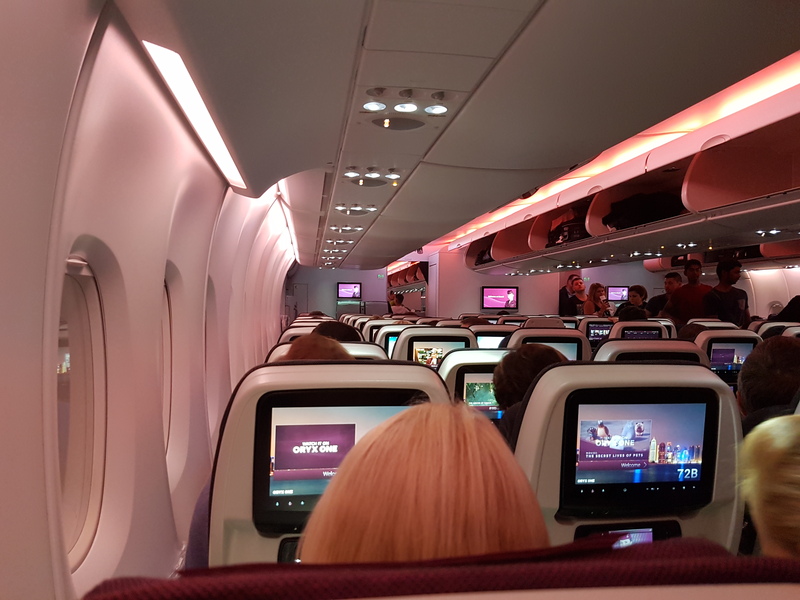 The worst thing though, when looking at your IFE screen, there is a horizontal very bright light in the second galley section right in line with your eyes. I had to keep moving head to the right avoid it as galley curtain not always drawn properly. As in previous reviews, I prefer rear section of Business, quieter and closer to lounge. Service though, exceptional, the hostess I had this time was superb, hats off to her. I only have entertainment 4 stars as it was spoiled by the light directly in eyes. Qatar again. Well done and thank you. We flew in A380 for first time from Syd to Doha. First impressions, its a real big plane for sure. Flight was smooth, the big plane can make you forget your speeding through the sky. Food was pleasant suprise, plenty of and quite nice, enjoyed it all. Entertainment was good but had a limited supply or reasonable movies to watch. I would have liked more varied music sellection, im spoilt by spotify at home. Service was goid. In all very happy with the experience. My first time flying with A-380 . Everything was O.K. but my seat had a problem with seat reclining adjusment . 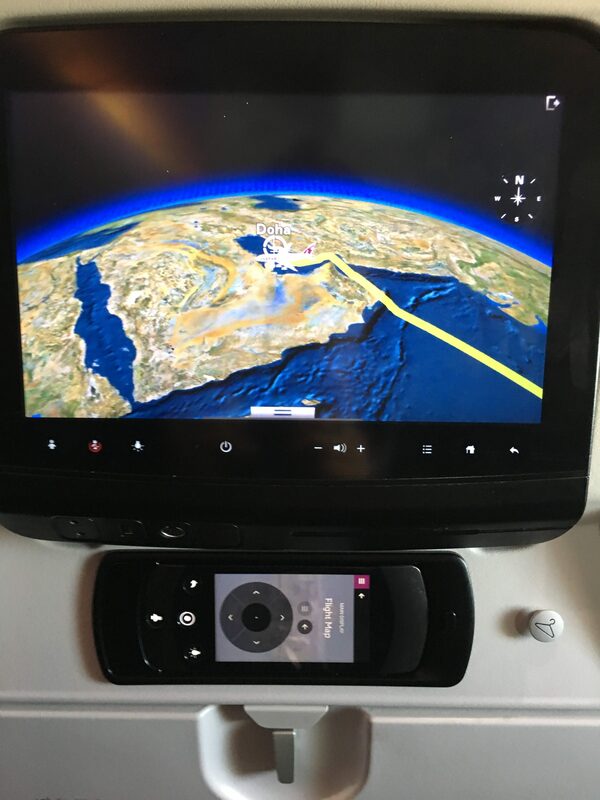 during my flight from Bangkok to Doha , whenever i wanted to press the button to adjust it , it did not worked properly , neither reclined backward nor to upright position properly . irrespective of this negligible problem , it was a lovely flight in a lovely plane.